Tom Brady and his model wife Gisele spent four years and $40 million building a European-style country estate in California. So it was one of those “Seriously? !” moments when they put it on the market a year later. Sitting on four prime acres in Brentwood, the property comes with a 14,000 square-foot main house. 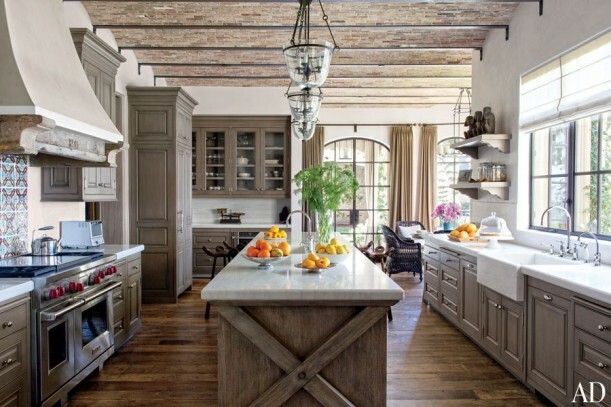 When it was featured in Architectural Digest last year, the kitchen was one of my favorite rooms. The Wizards of Waverly Place star and singer Selena Gomez is selling her house in the Tarzana neighborhood of L.A. It was built in the 1950s but totally remodeled in 2012 with over 6,600 square feet. You can tell it was redecorated with the gray trend in mind because there’s an awful lot of it. Asking price is $3.495 million. For more photos and information, visit Realtor.com and the listing with Craig Knizek. Actors Megan Fox and Brian Austin Green are selling the walled and gated 5,300 square-foot “Mediterranean Villa” in the Los Feliz neighborhood that they share with their sons. The house was built in the 1930s and boasts some killer views of the city below. Love that there’s a Darth Vader helmet in the powder room above and an R2-D2 that Brian reportedly built himself in the game room below. One of my favorite things about their house is the green tile in the kitchen and the big window over the sink. Asking price is $3.995 million. Check the listing and the article on Yahoo! Celebrity for more information. #1 is my favorite and, of course, it’s the most expensive. Oh why not go ahead and spend the whole wad? I’m going for Tom and Gisele’s. It’s exquisite. Selena’s house is way too gray, in my opinion. Went overboard for a trend, it seems. #1 for the pool, #3 for the view! Can’t believe I’m saying this since I can’t stand Giselle but their home is beautiful and dare I say, warm and inviting? From the outside I would have sworn it would be totally formal. Well I would take Selena’s because I love the exterior and the pool, but I would totally redo the interior. I have not gotten on the gray trend bandwagon yet, and don’t expect to start anytime soon. That house could really be beautiful inside with some color. The floors alone are gorgeous! I like #2 the best but I would definitely have to add some color to offset all of the gray! I have to vote for #2. I like gray, but then again, walls can always be painted. My husband and I would get lost in those big homes, but if I had a large family and the money and wanted to live in that area of the country I would go for #3, the Brian Austin Green & Megan Fox home. It looks the most like a home and that window over the sink in the kitchen is amazing. Isn’t Selena Gomez 12 years old? My goodness, a house like that at her age. No wonder these kids are struggling. Too much too soon – where do you go from there? I like #3. It looks the most like the hosue that someone lives in. Plus the views are amazing. All three are gorgeous. But I could most see myself in the 3rd, Megan and Brian’s. Those views…WOW! I must be weird – I don’t like any of them! They’re all way too big and overdone. I fell in love with the Brady home when it was in AD a few months ago. Everything about it was perfection. That said, the Green-Fox view is killer! How many houses have moat?! The view is just crazy and the breakfast nook is to die for! Love, love love the Tom & Giselle home!!!! Wish I could ever be in a position to drop a dime on that one; or millions of dimes! In my opinion, everything about this abode, home, mansion whatever is fantastic…. #1 is surprisingly beautiful. Way too big for my tastes–maybe the guest house would be more my “thing”. Anyone know if the cool chest at the foot of the bed, the one with a settee on the other side is one of those TV lift cabinets? These are all quite lovely, aren’t they? Number 1 is beautiful, of course, but I’m not sure that a European style home suits a California setting. Seems more like a ski resort in the Alps or something. Selena’s home is quite formal for a girl of her age. I was looking forward to seeing some funky colors and maybe more of a bohemian look. The exterior is incredible! I like the bones of number 3, but the decor doesn’t seem cohesive to me. It seems like perhaps the homeowners were battling a bit over what should be included in each room. I like none of them….I would take only to sell and buy something with character, not one that looks of a overpriced hotel……..but I guess that’s just me. Number three—wonderful views—they all have too many rooms, tho’—I don’t have a maid. Well, I’ll be the no fun, stick-in-the-mud….I cannot even picture myself in any of them; too big, too ornate. #3 Los Feliz has the most charm with amazing 1920’s architecture but then again, the smog, the heat… There are still great beach cottages on the beach in SoCal but not with acerage! I love #2 style wise, but the views from #3 would make me buy that one and redo the interior and exterior. Location, location, location. I love #2 because it looks the most homey. I definitely would get rid of the grey! I know I’m getting old when all of them give me a little anxiety of how hard it would be to keep up with that much space! I’m dying to move into a contemporary Mediterranean like #2, but #3 is just perfectly done. I’d choose #3 just for the views. I don’t really like any of them. I’m so sick of white and of gray. I’d choose #3 because of the views and I would redecorate for sure! Hi Julia, well I think they are all very nice looking homes but if I could I would choose no. 3 love everything about it….the kitchen be still my beating heart Oh…and those views….Mercy! Thank you for sharing. By the way got any spare change? Regards Esther from Sydney. PS that gray makes me feel cold and right now I could use a bit of warm. The kitchen is one of my favorite things about that house, too. Love that green vintage tile! If I had to choose one, it would have to be #2. It feels and looks the most homey, but the walls would need to be repainted. I love the interior of #1 and that moat, but it’s way too big and I wouldn’t know what to do with all of that space. #3 is nice, but I don’t like the different patterned walls. all gorgeous but I think I’d have to go with Giselle and Toms – it’s perfection – and that pool! None of them is my dream house. Number three’s view is definitely worth the effort to redecorate, though. I’m like a lot of the previous commenters, Number 2 with some color injected into it to warm it up. Love the wall tile in the bathroom and the ceilings. Like many, when the AD spread on Tom and Giselle’s home ran, I drooled. I just thought all the interiors (and outdoor spaces!) were so tastefully done. That said, I’d be happy to just hang out in the loggia in #1!!! And maybe migrate to the kitchen. I love that kitchen. One thing that has never appealed to me about LA living is unless you have serious cash, I am talking big big bucks like the first house, your neighbors are pretty much on top of you. #2 with #3s view ! Considering how beautiful the architecture of Giselle and Brady’s home is (though undeniably silly and over the top), I was surprised how stone cold boring the interior design is. And is that a cobblestone ceiling? Seriously? In earthquake country? No wonder they are moving! I mean, it’s really really beautiful, but there is a reason they didn’t find another house like that one in California. I love Selena’s bed. Could tell you she doesn’t have toddlers or a cats. Oh, why not, I’d take #3. I’ve always loved the charm of the 1930’s Spanish Revival homes in LA. With all the money I’d save not buying #1, I could spend a few million redecorating to suit my tastes and when I got tired from spending money, I could relax on those porches and enjoy the view! #1 would be my choice and I would have totally bought it but I don’t want to move. HAHAHAHAHAHA………okay, I’m lying but I would still love to live in house #1. Maybe I can buy it from Dr. Dre when I win the lotto!!!! I like #3. It is my style. I love that kitchen island. To die for. The 1st one is way over the top. Wow, number 1 is unexpectedly beautiful. I bet the architect and interior designer had fun putting that one together. With my millions I would choose it. With my leftover million I would move the pool house to where I currently live and move in. It’s kind of dreamy. I’m laughing that I spelled my name Patati.That’s a new one. #3 – I love the kitchen and the views! #1 is way too formal / stuffy for me. I love Tom and Giselle’s house, the kitchen is awesome, and I love that it was built earth friendly, but the view on #3 is pretty sweet! #1 very comforable feeling for such a large house. Love the kitchen! The pool in #1, the bath in #2 and the views in #3. But it’s have to be a Spanish and maybe in the Hills. I can’t go past the views for number 3. You would want an army of cleaners for number 1. I’m a sucker for a view so I’m going for #3 . Love them all, but I think my pick would be T&G #1. I guess the Megan Fox and Brian Austin Green house, but I really don’t like any of them. all three home are perfectly lovely, but just too perfectly decorated. i guess for me, they all just lack personality and the sense that they evolved over time with the owners’ tastes and interests. oh, well…i guess i’ll just have to save all of my millions for the next time ellen & portia or sarah jessica put a house on the market :)! I love the feel of #3, but I’d buy the first one. It is not as comfortable as #3, but great bones, pool, and style beat views. #2 is too gray. I would not want #1. Can’t stand the arrogant attitude of the couple and the house is just like them..overdone. look at that shower…spotlight? I would buy #3 if I could. Reminds me of old Hollywood, which I love. I grew up in Southern California and love the look. I don’t like the backsplash in the kitchen though. I have to choose Tom and Giselle’s home as my favorite. That outdoor living space just made the house for me! Selena’s house is nice, but it needs some pops of color.